Just a quick news flash after a long day of travel back home from Wimbledon. While I was in London, the acceptances for the Nationals came out and wild cards have been awarded, although I have seen only Boys 16s and 18s at this time. There is no qualifying as there was last year, with the draw going back to 192. The girls 18s field is strong, although perhaps not reaching the boys level. Usue Arconada, Michaela Gordon, Caroline Dolehide and Sonya Kenin, all in the ITF Top 25, are entered, as are Tornado Alicia Black, Kelly Chen, Claire Liu, Francesca Di Lorenzo and Ingrid Neel. Katerina Stewart and CiCi Bellis, both inside the WTA Top 200, did not enter. What a great Zoo field. So many top players. A pity Jared Donaldson isn't playing to add one more star to the draw, but understandable given his ranking and the strong likelihood he will get a USO WC regardless. Anybody remember how they do the seedings? I think it's something like top 600 ATP, then ITF, but I could be wrong? Anyway, I would say Tiafoe is the favorite, with Fritz and Kozlov close behind. 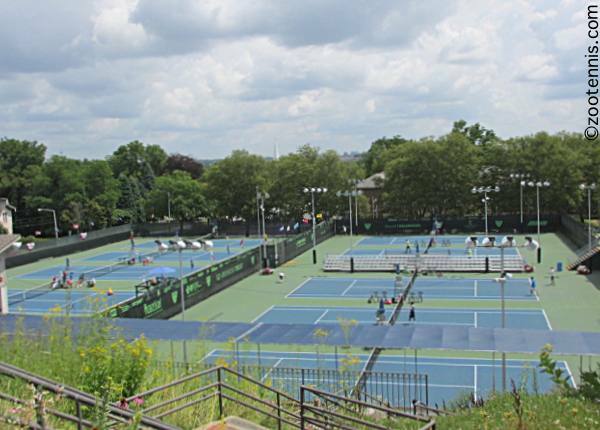 If a Junior is listed as a competitor for the 2015 National Champioships, B18's, in Kalamazoo, Michigan, may they also participate in the 2015 USTA Pro Circuit Edwardsville Futures, since the tournament dates overlap? It's Top 1000 ATP and Top 100 ITF that are considered, along with Top 100 ITA. There are 6 in 1st category as of Monday's rankings, 10 in the 2nd category, and none in the 3rd. It is my understanding that with the permission of both tournament directors, they can.